Coryn Williams has grown up in the megacity of Seacouver, where her every need is provided for—except satisfaction with her life. After her parents' suicides, her sister Lou fled the city to work on a rewilding crew, restoring lands once driven to the brink of ecological disaster by humans to a more natural state. Finally of age, Coryn leaves the city with her companion robot to look for her sister. But the outside world is not what she expects—it is rougher and more dangerous, and while some people help her, some resent the city and some covet her most precious resource: her companion robot. As Coryn struggles toward her sister, she uncovers a group of people with a sinister agenda that may endanger Seacouver. When Coryn does find her sister, Lou has secrets she won't share. Can Coryn and Lou learn to trust each other in order to discover the truth hidden behind the surface and to save both Seacouver and the rewilded lands? Brenda Cooper is one of those authors whose books you immediately pick up, maybe before even reading the blurb. 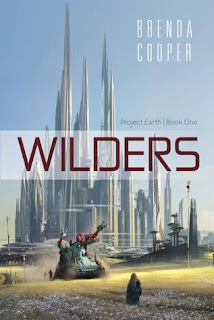 Wilders, first in the Project Earth series, is a prime example of her ability to create vast worlds with environmental, futuristic, and dystopian appeal. The dynamic between the characters and the world they live in is intriguing and pulls you in as the dangers they face are revealed. With robot companion in tow, Coryn Williams leaves the protection of domed Seacouver to reunite with her older sister, Lou. Lou works on the Outside on a rewilding crew, but her messages home convince Coryn that Outside is her next logical choice after graduation. Her travels opens her eyes to the truth of Outside and the factions moving to attack the city. The issues unveiled in the story show the complexity of the world readers will step into. I thought it interesting that the people Coryn meets try to keep her in the dark about what they're planning or why they're trying to force change because Coryn proves to be in a unique position to help. Her experience and tenacity drew me in to see what role she would play in the end. I enjoyed Coryn's character. She's sassy, smart, and not afraid to speak her mind or stand up for herself. She has the unique ability to connect with many different people and along the way befriends a variety of interesting characters. Coryn didn't really find her voice until closer to the end of the story, but her initial naivety helps readers get to know the true state of her world right along with her. Coryn's journey allows readers to experience the natural and technological side of her world. With steady pacing and an underlying sense of impending change, Wilder's delivers a complex plot that you won't be able to pull away from until you've reached the end of the adventure! I can't wait to see what's on the horizon for Coryn and her friends in the next book, Keepers!